Estimate cell density in bands from a tissue boundary. Given a cell seg table and an image containing masks for two tissue classes, estimate the density of cells of each specified phenotype in bands from the boundary between the two tissue classes. Path to a cell segmentation data file. Optional named list of phenotypes to process. names(phenotypes) are the names of the resulting phenotypes. The values are in any format accepted by select_rows. If omitted, will use all phenotypes in the cell seg data. Name of the tissue category used as positive distance, e.g. "stroma". Name of the tissue category used as negative distance, e.g. "tumor". Path to the segmentation map file. If NULL, look for the map in the same directory as cell_seg_path. data_frame with five columns (see below). The midpoint of the distance band. The area of the band, in square microns. 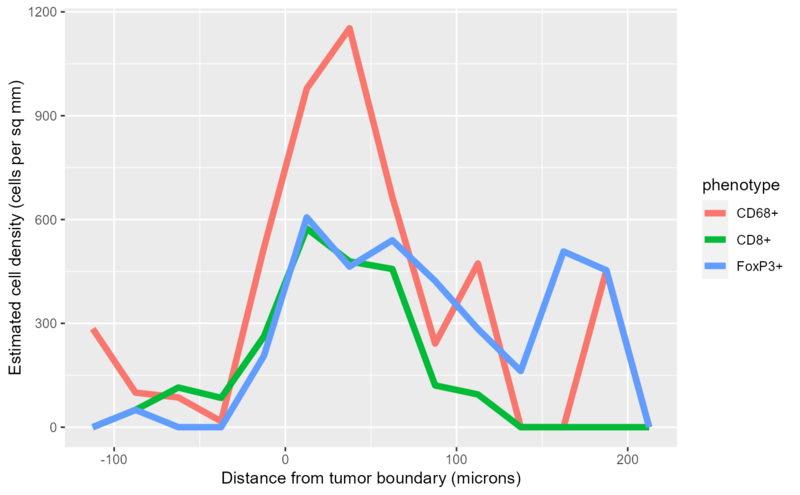 The density of cells of the phenotype in the band, in cells per square micron. density_bands uses a counting approach similar to a histogram. First the image is divided into bands based on distance from the specified boundary. Next, the number of cells of each phenotype within each distance band is counted and the area of each band is estimated. The density estimates are the ratios of the cell counts to the area estimates. Density estimates are in cells per square micron; multiply by 1,000,000 for cells per square millimeter. The returned value includes the cell counts and area of each band, making it straightforward to aggregate across multiple fields from a single sample. The aggregate density is computed by summing the cell counts and areas across all fields from a sample, then dividing to compute density. Developed by Kent S Johnson.